Easy to Operate, Obtain Answers Easily and Rapidly The UV-1900 on-screen user interface includes large, easy-to-see icons deployed on a black background, so the instrument settings are evident at a glance. In medicine, a spectrometer is a laboratory measurement instrument designed to identify the components of a complex mixture. - A mass spectrometer separates by mass the charged particles in a gaseous mixture. - Absorption spectrometers measure the absorption of a photon beam by atoms. They can be used to analyze most elements. - An emission spectrometer excites the atoms of a specimen so that they emit light at a characteristic wavelength. This procedure is more expensive, but enables more precise analysis with less interference. 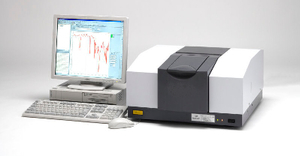 It also can be used on several samples simultaneously, saving considerable time.